I am trained as a dentist from Venezuela and am happy to bring my expertise to the patients at Nicolas Orthodontics. As an orthodontic assistant, I prepare the patient for their orthodontic appointments, make adjustments, work in the lab, and help the doctors place braces, appliances, and bands. I like to interact with our patients on a personal level and help them have a positive orthodontic experience. My team and I are always focused on the wellbeing of our patients. I love spending my time with my family and good friends. I also enjoy reading good books, watching movies, and going to the beach. I have been working with Dr. Nicolas since 2011 and have been trained in all aspects of orthodontic assisting, including scanning for Invisalign®, preparing for and assisting in all orthodontic adjustments, and making retainers. Working one-on-one with our patients is the highlight of my day. I love making people happy by providing them with excellent care and—eventually—a beautiful new smile! Our office is full of people who truly care about our patients and the quality of care they receive. It makes for a very happy and relaxed environment! When I’m not at work, I love to shop, read, and go to the beach! I am a certified Orthodontist from Colombia and I am very excited to be a part of Nicolas Orthodontics! I work with patients during all aspects of their treatment, whether they are new patients in need of initial records, current patients in for adjustments and wire changes, or patients who’ve finally had their braces removed and need to be fitted for retainers. The best days are when I get to see patients’ new smiles and the looks on their faces after their braces are removed! I feel so fortunate to be doing what I love in such an amazing working environment! As the financial administrator at Nicolas Orthodontics, I take care of the financial and insurance needs of our patients. I am happy to share my many years of experience and to be part of this prestigious and state-of-the-art practice. I graduated with a B.A. from Brooklyn College and New York School of Medical Assisting. I have worked in healthcare for 30 years, and have enjoyed working in the fields of orthopedics, internal medicine, and cardiology. 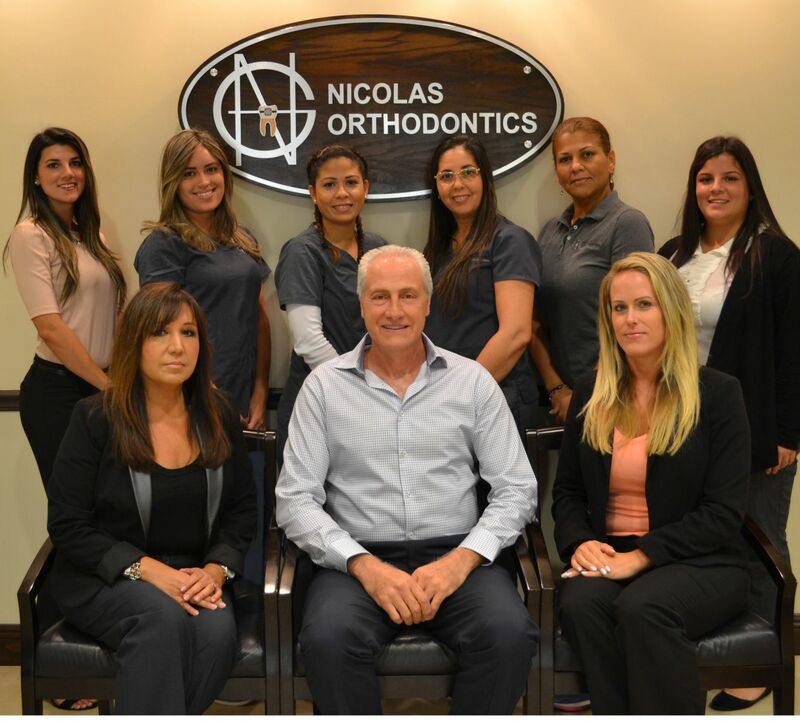 I have now been part of the orthodontic field for more than 15 years and have the pleasure of being part of the wonderful staff at Nicolas Orthodontics. My favorite part about orthodontics is the life-changing results our patients experience because of their beautiful and healthy smile. They are so happy the day their braces come off, and our entire staff shares in their joy. My husband and I are the proud grandparents of two bright and handsome twin boys and a daughter who is an accomplished chef. My husband also works in the orthodontic field. We love taking trips with the family to Disney and try to visit family in the heart of wine country, Sonoma California. I enjoy antiques, interior design, fine dining, and a nice glass of cabernet. As our treatment coordinator, I am equipped with many years of dental experience and am here to assist all of our new patients in their orthodontic journey. My experience and preparation enables me to provide excellent, practical and honest insight. I look forward to coming in to work and seeing the difference we make in patients' lives with their beautiful smiles. I studied at Palm Beach State College and I’m originally from Long Island, New York. My hobbies include dance and ariel yoga. I also enjoy eating out, playing tennis and baseball. Its a pleasure to be part of the Nicolas Orthodontics team , as the front desk coordinator i enjoy interacting with our patients and the staff. I strive to offer a pleasant patient experience at our office.The best part of my day is seeing happy patients and their beautiful smiles. I am originally from New Jersey , recently moved to Florida . I enjoy the beautiful florida beaches and the sunny weather that I wake up to every day. It is a pleasure to be part of the Nicolas Orthodontics family , I am a Biology graduate from Florida Atlantic University. My role in the office is to create initial and final records for patients. I also assist in the front desk and with marketing for the office. I enjoy being able to work closely with patients and seeing their beautiful smiles. I enjoy spending time with my family and friends. I also enjoy being an active memeber of my church helping with kids. I love to work at Nicolas Orthodontics, Here i am able to help support people to live a happier and healthier life. I am excited to come to work each morning as everyone shares the same vision and is dedicated to the same mission. This truly creates a family environment where everybody is there for patients as well as each other. When I am not at work, I love spending time with my twin daughters, reading a good book or exploring Florida on weekend trips. "Dr. Nicolas is a pleasure to work with. He is great with his patients and explains everything completely. The office is immaculate, the staff is friendly and accommodating. He and his staff work very hard to keep appointments on schedule. We are very pleased with the results! I highly recommend him as an orthodontist! Thank you Dr. Nicolas." "Best Orthodontist ever! We spoke about my options the first day I went to see him. He sent me to a Prosthodontist to assist in my care. He also chose my oral surgeon. I had jaw surgery one year ago and got my braces off in October. My teeth look amazing!! I have referred friends that are wanting to get braces or get their children braces to Dr. Nicolas. I am soooo glad I chose him. Very sweet doctor"
"Dr. Nicolas is very professional and dedicated to his work. You can tell that he loves what he does and cares about his patients. He believes that orthodontics is an art and he can make masterpiece. Thank you for changing my life and turning my ugly smile into my best feature!" "I want to say that he is the best orthodontist I have ever dealt with. He told my daughter when she would have her braces off and delivered. He has the best bedside manner you would want in a orthodontist. He and his office make you feel like a person not a number. Very professional and caring. I would recommend him to anyone who is looking for a orthodontist. Best in Florida by my opinion." "Dr. Nicolas is the best, my smile looks great! I’m very happy with the results, his new office is beautiful and the staff is so nice and friendly."